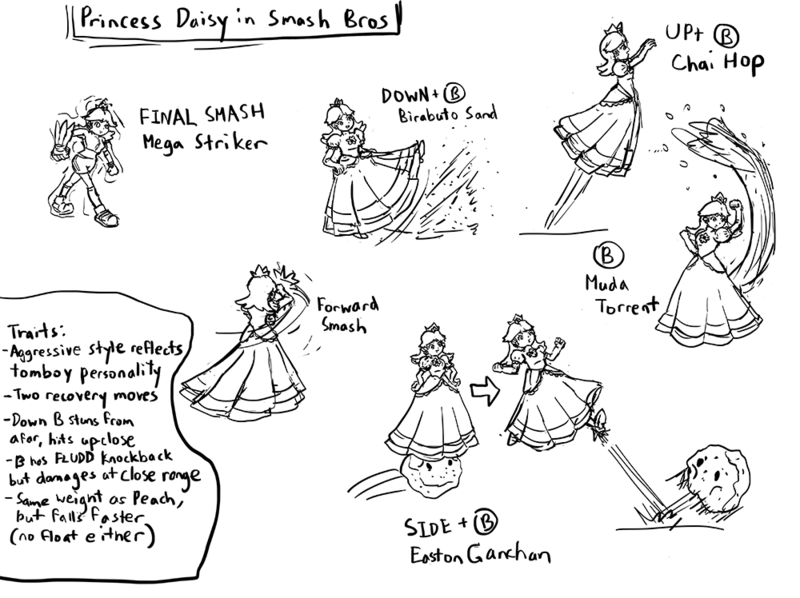 Princess Daisy for Super Smash Bros. Following up the concept drawing I made for King K. Rool in Smash Bros., here’s Princess Daisy from the Mario series. While Daisy’s most prominent appearance over the years has been in the multiplayer games, for the most part I thought it’d be cooler if her attacks referenced her debut game, Super Mario Land. Each special attack is based on one of the four worlds from Super Mario Land. One notable thing is that most of her attacks have a small added effect that gives them different properties if they hit close or mid-range. Birabuto Sand does solid damage if the actual kick connects, whereas the sand portion stuns the opponent. Muda Torrent works similarly, where the uppercut hits hard but the water has something of a FLUDD effect. Easton Ganchan can transition from recovery move to bouncing projectile. Her Chai Hop, based on the Pionpi enemies from World 4, is a fairly basic move but varies her recovery options alongside her Side-B. Ideally, this means using her would involve deciding whether or not in any given situation to fight up close or at a slight distance, and what is the best way to transition back and forth between the two ranges. Daisy’s Final Smash comes from the Super Mario Strikers series and grants her boosts to speed and offensive power. Additionally, many of her attacks will launch flurries of mechanized soccer balls. This entry was posted in art, smash bros, video games and tagged smash bros 4, super mario bros, super mario land, tablet. Bookmark the permalink. Move List possibilities for Princess Daisy. Daisy would be like zero suit Samis in which she would lose her dress and be using her sports alter making her faster as fast as Capt. falcon she would save herself from falling by launching herself sideways like Luigi and few other moves like Luigi and while in her dress would be like peach floating back on stage and while peach slaps Daisy would punch it be a little slower then Peach but more damaging and she would do mario striker attacks like you mentioned if she gets the smash ball using her Crystal powers? I think it be nice if she had several different fighter stance Hi I’m Daisy could be one of them Hot stuff ssss from mario strikers is another one That’s Right mma (kiss) instead of polling radishes out of the ground like peach Daisy would pull out a weaker version of BBomb and instead of Peach’s tennis racket Golf club and frying pan Daisy would bring out a baseball bat not quite as strong as the ones you get in the item boxes kind of exactly like Ness had and at The moment I can’t think of anything else maybe something of Luigi’s. Here’s a note of interest just for fun do not launch Daisy and Luigi towards each other if they hit it would send both of them off the platform into the Sky.